Various standard sizes, Custom engineered design offered, Different shapes for your applications, Alumina,ZTA,SIC mateial available. Oxide ceramic alumina tile has charaters of abrasive & wear resistance,corrosion resistance,high temperature resistance,low weight,easy installation.which can effectively protect industry material handling machines against wear damage.especially applied in mining,port,cement,steel plant,power generation industry etc. Chemshun Ceramic oxide ceramic tile include 92% Al2O3,95% Al2O3,Al2O3+ZrO2 compostion series. 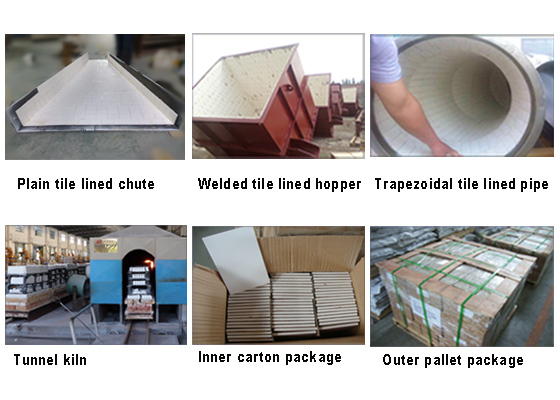 different shape tiles including plain tile, weldable tile,trapezoidal tile,curved & lock tile, engineered tile with special geometries can meet your different wear solution requirement. Chemshun Ceramics can offer ideal ceramic alumina tile liner scheme according to customer’s different working environment and industry.custom-made abrasion resistant liner available .